Hi from the team bringing you the Poppet project. We would love to share with you this project as it evolves. 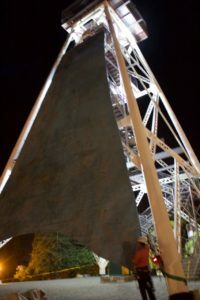 For those who haven’t h eard of it yet the Poppet project will see the creation of a new aerial performance, projection & sound spectacular on the iconic poppet head in the heart of Bendigo. 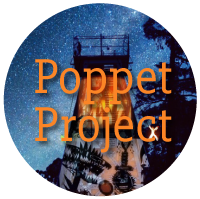 Poppet is a Regional Centre of Culture commission being presented on October 20th 2018. Built into the project are a series of Creative Development periods with community in Bendigo. Local partners in the project include the Golden Dragon Museum, the Dja Dja Wurrung Clans Aboriginal Corporation, the Bendigo Historical Society and CreateAbility. We aim to gather a range of stories and lived experience of Bendigo, and work with community and artists to celebrate and share these on this iconic structure in the heart of Bendigo. Thus far with visits in March & May we have gathered the artistic team, shared research, met up with partner organisations and ran some introductory workshops in shadow work and animation. With the help of our riggers we have also tested the skinning of the Poppet head to identify best method and materials to use. We will be projecting onto three sides of this tower. We also had a delightful morning gathering stories from members of the Bendigo Historical Society and recording some VoxPops in the street about life in Bendigo. We are returning at the end of June and among other activities we aim to include some aerial workshops, a Walk on Country, and catching up with the local Field Naturalists.